The small alarm clock beeped incessantly for at least a minute until I turned it off, groggy and cold. It was already past seven o’clock and I was surprised that I slept “in” so long. To my dismay, there was no beam of light shining through the thick woolen curtains. Just darkness. There were no birds singing their beautiful songs, only the sound of the nearby llama grunting and the thunderous footsteps of other trekkers clomping past our room. Despite my heavy meal and multiple glasses of cherry red wine, I slept poorly which was surprising given the extreme fatigue and exhaustion my body felt from the successfully completed eight hour hike. Then I remembered the reason: That late night thumping, crashing and booming of techno music from down the street. I thought being in an extremely small town, in the middle of nowhere guaranteed peace and quiet throughout the night. Obviously I was dead wrong! Apparently there is a disco several blocks down the street that is open until 4 am and it is usually wall to wall people every weekend night. I had to remember that I wasn’t twenty anymore; in fact perhaps this was a sign that I was getting old! Yet I was still cranky that morning, not having enough sleep and not seeing the sun shine through the window. I desperately needed a hot cup of strong, rich java. Today’s hike was to another famous landmark, Cerro Torre. Cerro Torre and Fitz Roy are two of the most formidable mountaineering feats in the world due to their steep, upwards granite spikes that seem to swirl up into the air like a giant tornado. I learned that mountain climbers from all over the world come to El Chalten, where they base themselves for weeks and even sometimes months waiting for the one or two days possible to summit the peaks. The weather there is that unpredictable. The summits are that dangerous as well. 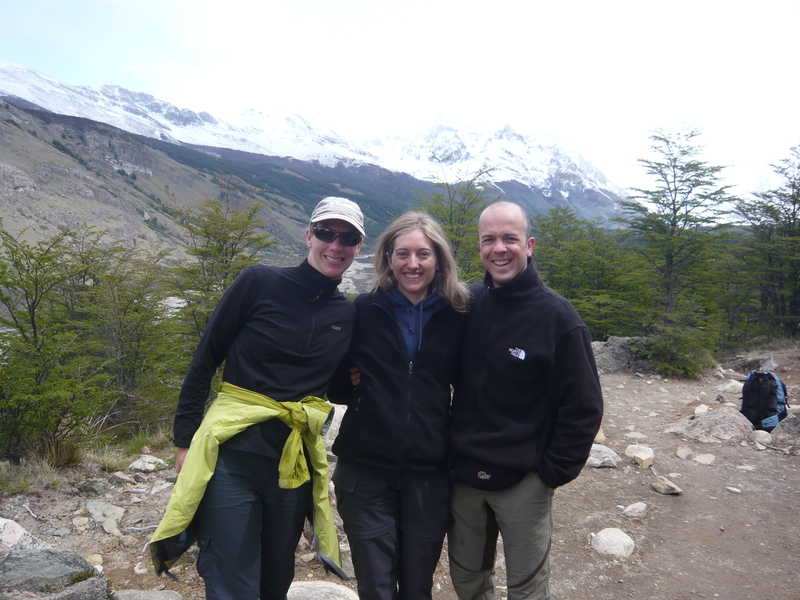 I’ll never forget the story Fabricio, our Argentine guide, told us about that perilous climb. He said that two young men in their twenties, at the height of life and oblivious to the fact that they were not invincible (which we all believe we are in those prime years of youth and discovery) had set out to summit Mount Fitz Roy. The weather was excellent when they started out but somehow it turned from bad to worse and the two young men were trapped on top of the mountain in insanely strong winds and whiteout conditions. They tried their best to get down but unfortunately there was a tragic accident and the rope to one of the climbers was clipped on a jagged, razor-sharp rock. He stumbled hundreds and hundreds of feet to his untimely death, devastating his climbing companion and the entire climbing community. It brought a cold chill to my bones thinking about how fragile our lives can be and how quickly things can change in Patagonia. 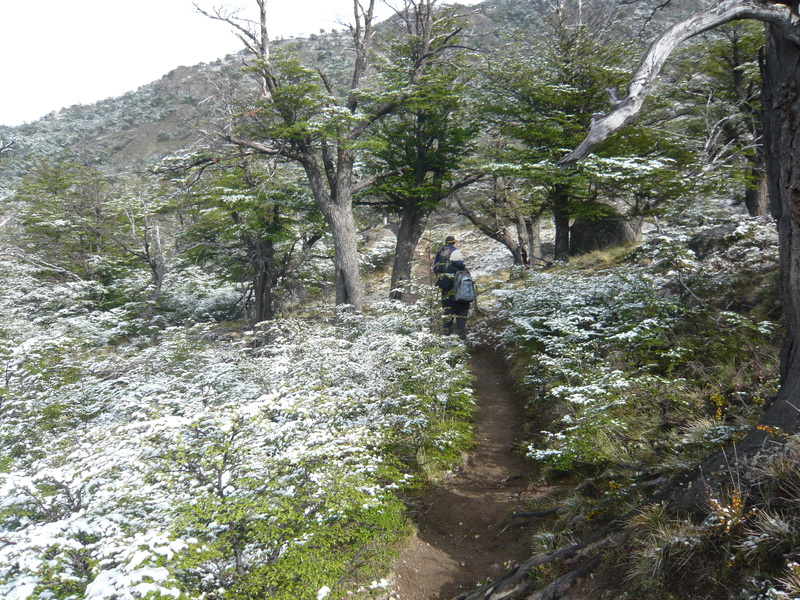 The hike to Cerro Torre is not as long or difficult as the haul up to Fitz Roy however, it is supposedly equally as beautiful and pristine. We were obviously not as fortunate weather-wise as the day before. 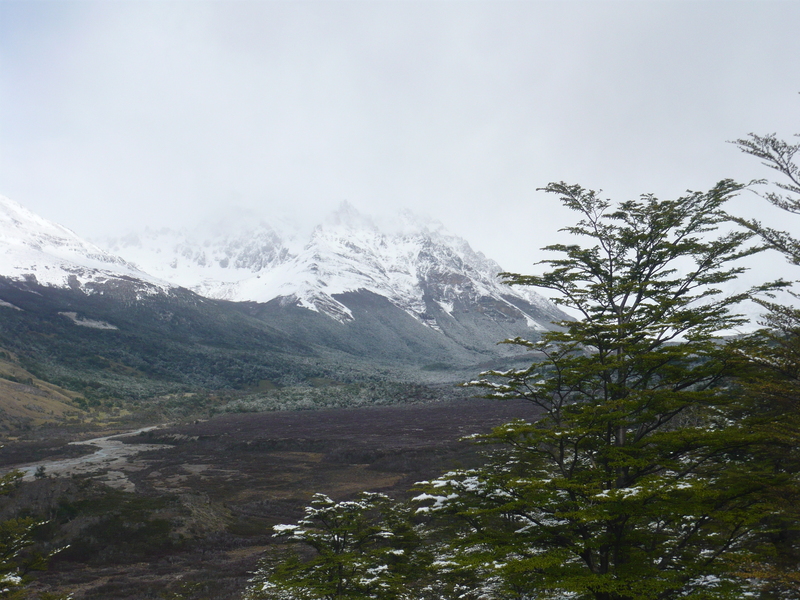 The sky was misty, a typical day in Patagonia. We realized how much we had lucked out the day before with the crystal blue sky and cloudless day. A rare treat in Patagonia, that is for sure. A new couple joined our group, Ricardo and Illaria, newly-weds from Milan, Italy. Rici was a true gem, a rare find of humor, self-deprecation and intelligence. Exactly the kind of person I love to meet on a hike! The four of us talked for hours, sharing stories about our lives and cultures. One of the best things about hiking in another country is the people you meet. Usually they are just as wild and crazy as you are and there is always a place they’ve discovered that you’ve never been to….yet. I could talk about traveling for hours and truly loved to meet others as passionate as me! My mind was racing as I secretly plotted out my next adventures, hoping my husband wouldn’t find it as an excuse to tie me to a chair. It was obvious to me that a true wanderlust will never be satisfied with their desire to see the world. It is a passion that is never-ending and one I hope to someday instill on my young children’s hearts. 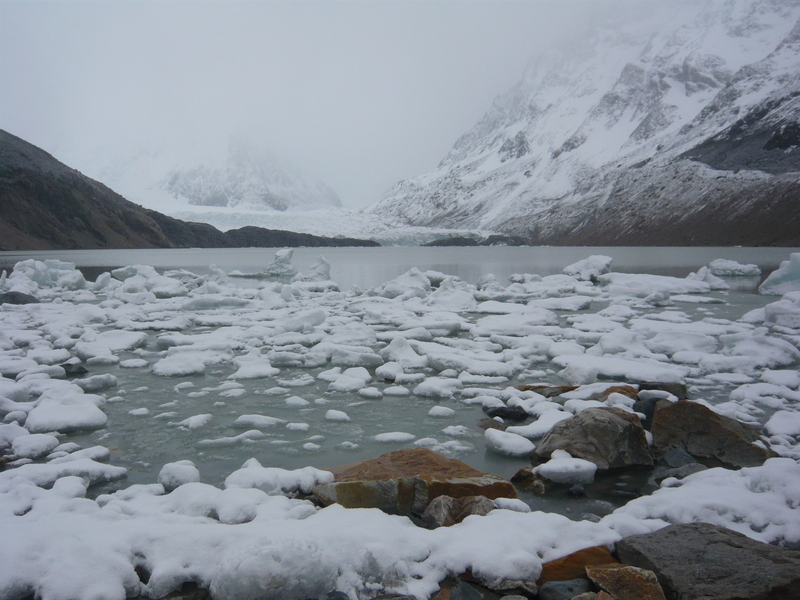 As the hike progressed, the visibility worsened and it got really, really bone-chilling cold. Again, it was nothing at all like the twenty below zero tundra of late January in Minnesota. Yet still it was very damp and cold which made hiking rather unpleasant. We reached the end of our hike, freezing and slightly disappointed that the weather had not improved. 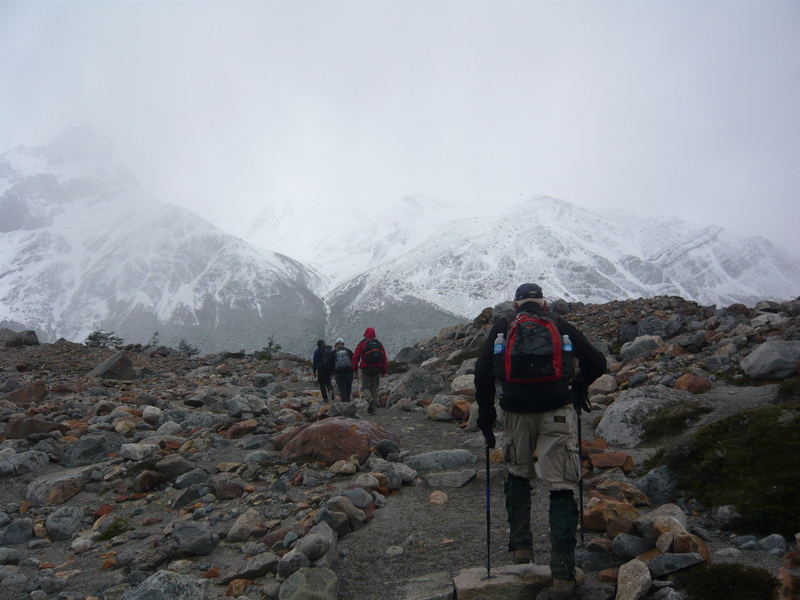 The end of the hike was supposed to offer a fabulous view of Cerro Torres but it was hidden in the clouds. 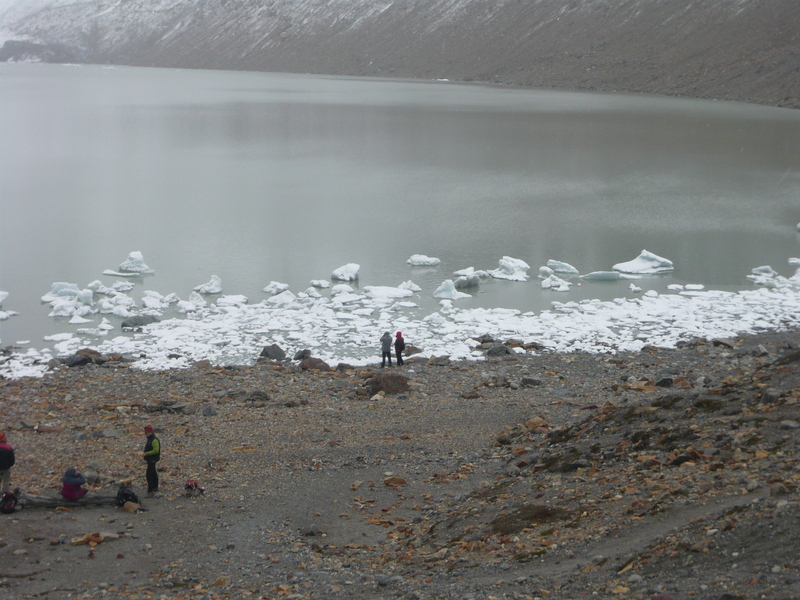 We could barely see the glacier at end of lake, too bad! 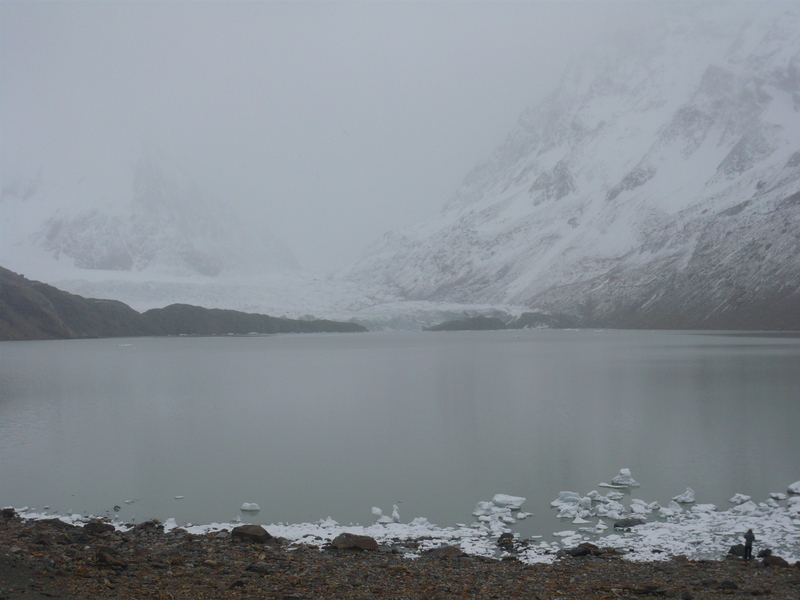 Despite the fog, the view was incredibly lovely of the glacier and icebergs and once again it was a phenomenal place to refill our water bottles. The water was so pure, it was outrageous and tasted delicious. We proceeded directly back to our hotel to warm up and rest (of course over a warming glass of red wine). That evening, we had one of our best meals ever in Argentina at the little inn next door. The owner had built the first building in this town 25 years ago and the place was full of black and white photos of his inn, the mountains and nothing else. It was our last night in the tiny town of El Chalten. I was feeling rather nostalgic about it. It was a place that you only can experience in a dream; it is like nowhere else I’d ever been. What amazed me the most about it was how it had managed to survive, all these years, so far away and in such an extreme environment. 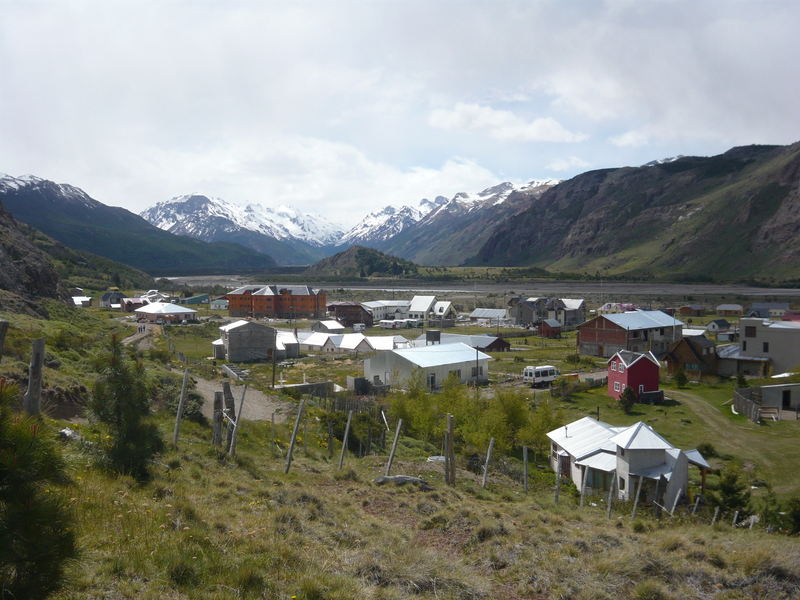 As we left on the one bus out of town, passing through the old, tin buildings on the long, rustic street that lead to Ruta 40 and back to El Calafate, I thought of an old proverb I had heard about Patagonia. Once you’ve been there, you’ll always come back. I trusted those words to be true.